Tuesday was such a bitterly cold and miserable day that I was feeling rather daunted by the prospect of heading off to Kempton for night racing yesterday. However, I needn't have worried because the good thing about a really cold day is that it makes subsequent cold days, if slightly less cold, seem really rather clement. So that was fine - as was Roy's run. Needless to say, he/we have nothing to show for it because he finished fourth, but it was a good fourth, only just nosed out of third place, and not beaten far by the winner. He's been a slow learner, but it was the most competitively he's ever run, and one has to feel that we are finally closing in on the target with him. 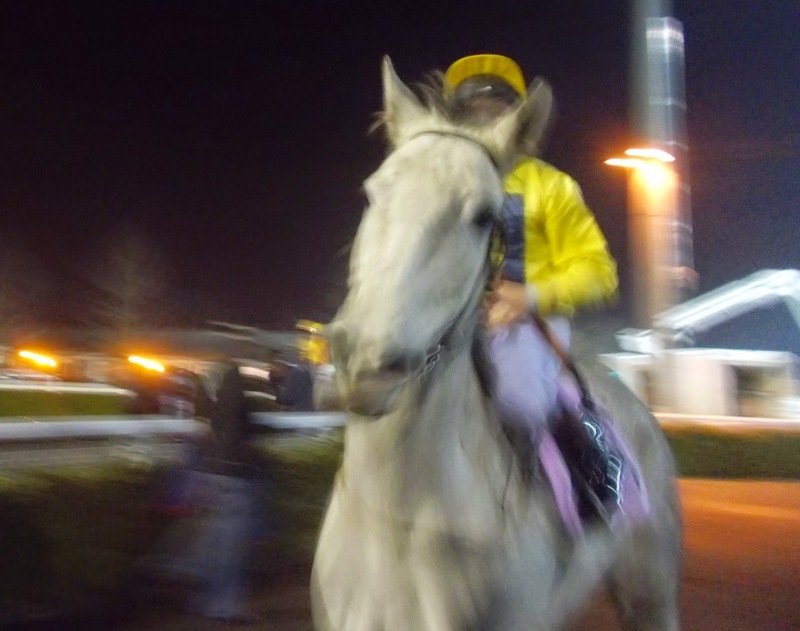 You could go to the 8.00 at Windsor in the summer and it would be a piece of cake, but the 8.00 at Kempton in the middle of January is quite a test of stamina. Still, we weren't back too late as we got home just after 11.00. I was starting to get the nods towards the end of the journey, but it was OK. And I don't think that Roy was put out by the hour at all: he has much greater powers of endurance than I have (which is understandable as, after all, he is 43 years younger). 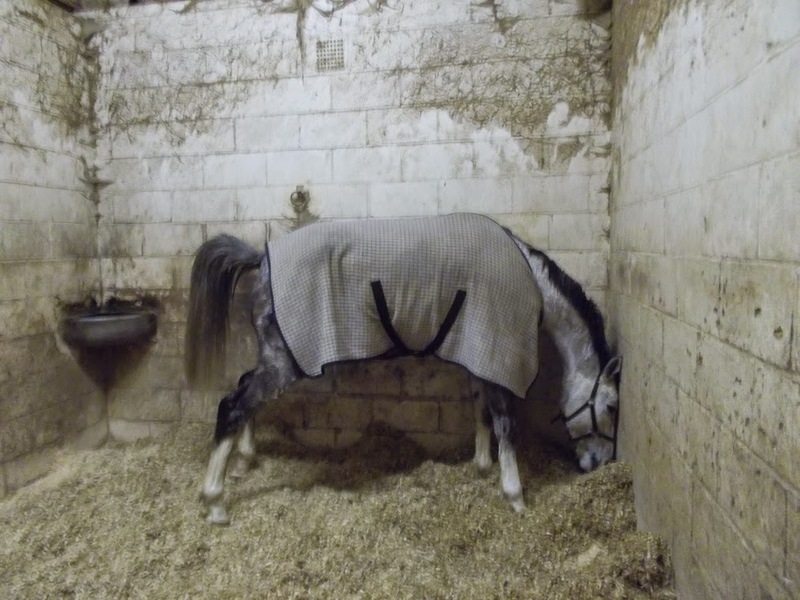 So he was still relatively fresh when we arrived back, and probably the only thing we had in common was the thing which everyone has in common after a journey - as you can see from this picture of him relieving himself on arrival back in his stable. 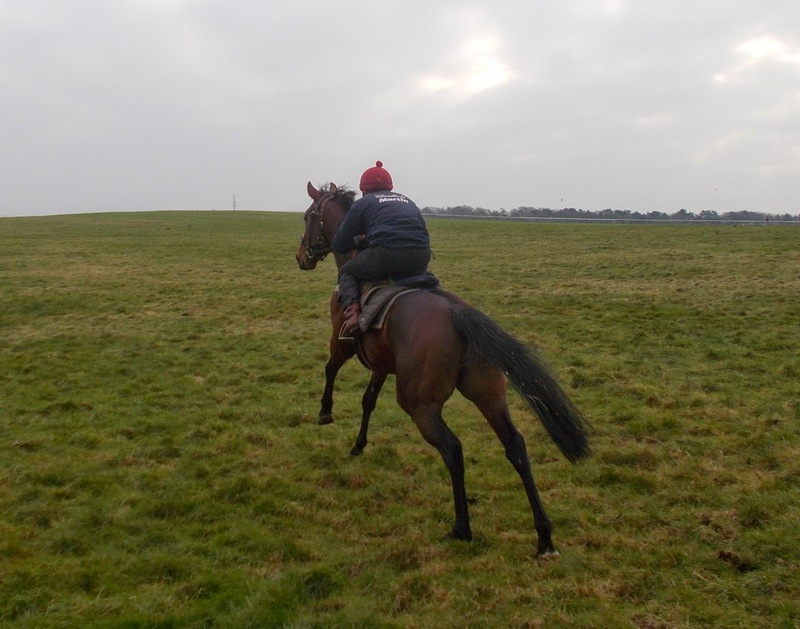 Our next trip will be very straightforward: Senator Matt runs in the 2.00 at Lingfield on Saturday. The evenings are already starting to draw out, so we'll have some daylight for most of the journey home before arriving back here (fingers crossed) around 5.00. Less straightforward, of course, will be the race. Senator Matt (seen here coming out of the stalls this morning under Robert Tart) ran a nice race on his debut last month - but, of course, a mile maiden for three-year-olds and upwards in January is a very different kettle of fish than a similar contest in December. That, of course, is because the January race includes the new generation of three-year-olds, who are (probably both more classy and (definitely) receiving of nearly a stone and a half of weight. So he might find the regally-bred couple of Godolphin runners and the horses trained by Roger Varian, Richard Hannon, Mark Johnston, Mick Channon et al. to be nuts harder than ideal to crack. But he's a nice, honest horse, and he'll do his best.